UA President Pat Gamble approved the waiver for the next two academic years to test its success. Students admitted under the program will continue to receive the waiver so long as they are continuously enrolled and qualify. “Come Home to Alaska demonstrates our commitment to grow enrollment while maintaining quality and affordability. Educating students in Alaska is good for Alaska’s future, as graduates tends to remain in state and get jobs,” Oba said. For more information, call Kate Ripley, UA Public Affairs, at 907-450-8102 or klripley@alaska.edu. 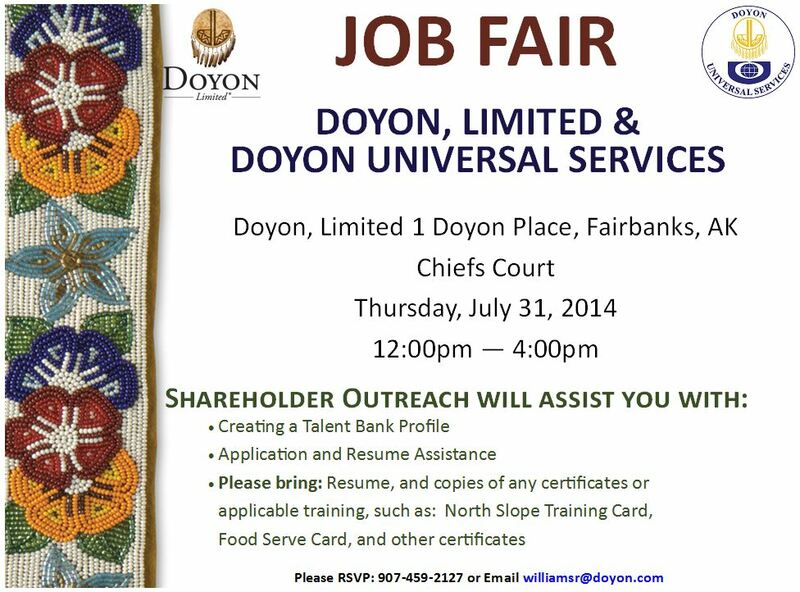 Please see the below information about an upcoming job fair at Doyon, Limited. The internship affords students, recent graduates, and veterans an opportunity to gain professional experience and develop leadership skills. The program is designed to be hands-on to strengthen understanding of the Executive Office and prepare students for public service careers. The program is available to current undergraduate or graduate students, undergraduate and graduate students who have graduated within the last two years, and veterans who have served on active duty within the last two years. Applicants must be U.S. citizens. This internship is unpaid; interns will need to fund their own transportation, housing, meals, and other associated costs. The deadline to apply for the spring 2015 semester internship is September 7, 2014. Applications must be submitted online and must include two essays, a current resume, and two letters of recommendation. Click here to view all the requirements and to start the application. Visit the program’s FAQ webpage for more information about this exciting opportunity. Want to be part of the team that helps shareholders realize their dreams? Doyon Foundation is currently seeking applicants for our administrative assistant job opening, a full-time, Fairbanks-based position. This employee works closely with the executive director, provides administrative duties and board support that enables the Foundation to operate efficiently. Our administrative assistant also works with the Foundation team to support the language revitalization program, scholarship programs, community relations and fund development. Learn more and apply on the Doyon, LImited website! Award Amount: This scholarship will be a tuition waiver of up to $5,000 for at least 10 students and possibly several alternates for the 2014-15 school year. Application Procedure: Write a 400 to 600 word essay on family, financial or personal adversity resulting in a challenge to attend a higher educational institution. Submit the essay along with the rest of the George W. and Mary A. Jones Scholarship application available online at tinyurl.com/1415Jones. Apply for the September Doyon Universal Services Facilities Training Program at www.doyon.com today! The deadline is August 18. Any questions can be directed to the DUS shareholder outreach department at 1-888-478-1300 or aloysiusl@doyonuniversal.com.